If you are located anywhere close to the Riverside County, California, you cannot afford to miss this great 9-day-long event! 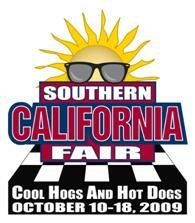 The 2009 Southern California Fair opens today and it closes only on Sunday the 18th. The fair takes place in the Lake Perris Fairgrounds and admission is as low as $8 a person, half-price for kids under 12 – and that fee includes all day entertainment, even the arena shows! All military personnel get free everyday admission, today all boy and girl scouts do too, Tuesday is a $2 day (admission, food and carnival) and all seniors and children get in for free on Friday. There’s just something for everyone there! From thrilling carnival rides, exhilarating motor sports, delectable food, fabulous exhibits, excellent entertainment, to incredible shopping and so much more! Some of the spectacular arena shows include everyone’s favorites – Monster Trucks, Freestyle Moto X, Truck and Tractor Pulls, Speedway Motorcycles with Sidecars, Sprint Car Races, Quad Freestyle & Off Road Show, Demolition Derby and the El Toro Huaco Mexican Rodeo –the bull riding is the only show that requires aditional admission, and it happens on Sunday, the 11th. In addition to all that, there are two new special shows never seen before at the SoCal Fair: The incredible Jet Car Meltdown on Tuesday and the great RV Demolition Derby on Sunday. You have to see it to believe it! Everyday you can also enjoy plenty of free entertainment all around the fair’s 108-acre area: Pig Races, the Wild West Turkey Stampede, Magic and Juggling, the Balloon Man, and so much more! Plus the new and fearless grounds act addition of the year: the Pirates of the Colombian Caribbean! As well, the fair offers great free (with admission) musical performances by the Doo-Wah Riders in Concert, Opus Humanus, Shy Town, Avenue A, No Longer Together, Wave Invasion, Souljouners, Wayside Loop, Factory Tuned Band, DMC Express, 5th Dementia Band, The Velvet Stones, Miss Lolitas, Some Times Country James Isabel, FailSafe Forgiven, All In, U-Turn, Halocene, Crystal Portillo, Hellbound Cats, The Passports, all those happening only at the Budweiser Band Stage – and so much more will go on the other 4 music stages. Besides all that there’s also a Funnel Cake Eating Contest, Eye Adventures – the optical illusion show, great exhibits and, of course, livestock! So get ready and gather up some energy because this week is going to be a heavy load of excitement! Better than sitting at home and watching TV!